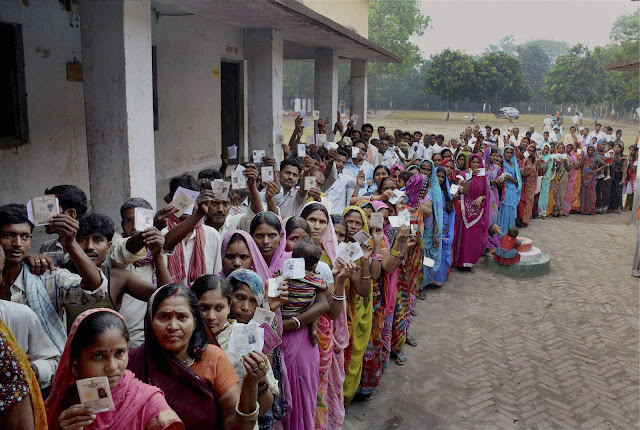 Bihar:The voters participated pleasantly in the Bihar assembly election 2015 on Monday and have franchised their votes on polling stations. The 57 percent voters uploaded by voting the fate in the EVM of 583 candidates in the fray. The voters used their democratic right peacefully. It concluded that there were the strong security deployed. So strong patrolling was that the 100 people were arrested for the hurdle to conduct the polling. The 49 assembly seats in the first phase of polling under 10 districts have been yet completed the election. The surge of voters were seen on the polling stations since morning. The sun up: the sleeves up -- for the franchise of their votes were seen.The long queue of women voters were seen in rural areas. According to the Additional Chief Election Commissioner, R Laxman, there were occured no untoward incident except sporadic. Sikandra, Jamui, Jhajha, Chakai, Govindpur, Rajauli, Suryagarha, Jamalpur, and Tarapur -- all highly Naxalite hit zone's polling of assembly seats were allowed till 15.00 hrs afternoon; while other 4 Beher; Katoria; Beldaur; Aloli assembly were polled till 16 hrs afternoon. The people waiting to vote were provided the chance on the remaining 36 seats to franchise their votes till 17 hrs evening. The ideal polling stations' glimpse were like the fair. Many veteran leaders' prestige are on stake. The information and broadcasting and water resource minister, Vijey Chaudhari and the nephew of Ramvilas Paswan Prince Raj Paswan are respectively from Sarairanjan and Kalyanpur in fray under district Samastipur assembly seats. The former minister Narendra singh's sons Ajey Pratap and Sumit Singh's luck have been closed in the EVM from Jhajha and Chakai.